touches of sense...: A child's sighs. 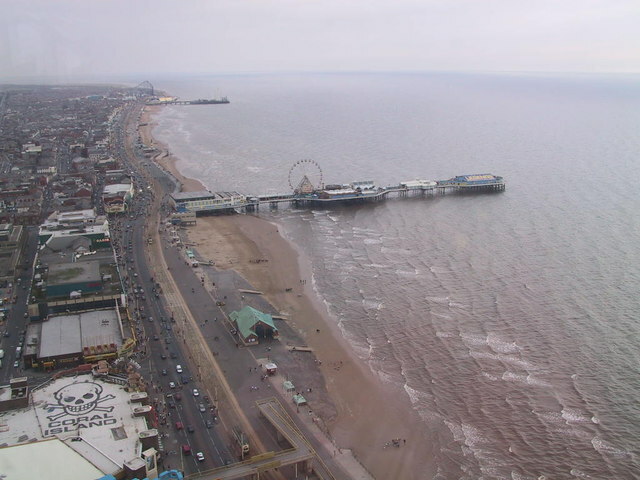 Mrs Scottner's 360° view from her house at the top of Blackpool Tower is exceptional if somewhat mundane. Despite the undoubted inconveniences: high heating bills, lack of garden, mass of tourists in high season, the long lift-ride to pick up the milk and the Blackpool Herald, Mrs Scottner would never imagine living elsewhere. Mrs Scottner and Blackpool Tower go together like cheese and crackers, cockles and mussels. Don't try to Google her. You will most probably not get any hits. Invisible to anyone who might search for her, Mrs Scottner has now been Blackpool Tower's sole resident for the past forty seven years or so. I can still remember the early designs for her house. I could probably still rebuild her house with the same Lego bricks that I used when I was a child of five. I remember pretty much the assembly of the framework, the windows and the flat roof. If I think back, I can still remember that Mrs Scottner and I had long conversations. "Who are you speaking with Simon?" "I am speaking with Mrs Scottner." A child of five sighs. "She's the lady that lives at the top of Blackpool Tower." "But nobody lives at the top of Blackpool Tower." I was reading an adult article yesterday. It was entitled : 2014: The Death of the Postmodern Novel and the Rise of Autofiction. "My concern is how we live fictions, how fictions have real effects, become facts in that sense, and how our experience of the world changes depending on its arrangement into one narrative or another." "All of these novels point to a new future wherein the self is considered a living thing composed of fictions. Although critics will endlessly retread tired discussions concerning fiction vs. reality (and therefore the exhausted conversation about “realism”), that isn’t really what’s at stake here. What’s happening is that new novels — like the abovementioned 10:04, The Wallcreeper, and My Struggle — are redistributing the relation between the self and fiction. Fiction is no longer seen as “false” or “lies” or “make-believe.” Instead it is more like Kenneth Burke’s definition of literature as “equipment for living.” Fiction includes the narratives we tell ourselves, and the stories we’re told, on the path between birth and death." Is Mrs Scottner less real than I? It has been a long time that I have known her. I am struggling to hear her voice now. This is so timely for me,Simon, S I struggle with my child's ability to make-believe and learn to appreciate her fiction (and make new fiction WITH her) as something positive rather than lies. I also keep remembering my own childhood characters. I had lots of bros and sisters (in reality i am an only child) and characters that scared me, too. Why do we maintain the latter? Maybe because it is better than real things that scare us? Î suppose story-telling is universal and multi-facetted as are children. What is factual for an adult is often make-believe for a child. I also feel that 'facts' are of much less importance and interest than prevalent fictions. The advantage of our imaginary scary characters is that we can manipulate them and retain some sort of control. I think that if you are struggling with a child's fiction it must be much more of a struggle for a child to deal with an adullt's 'reality'. I think children use 'lies' partly to map relationships and to find space which belongs only to them.